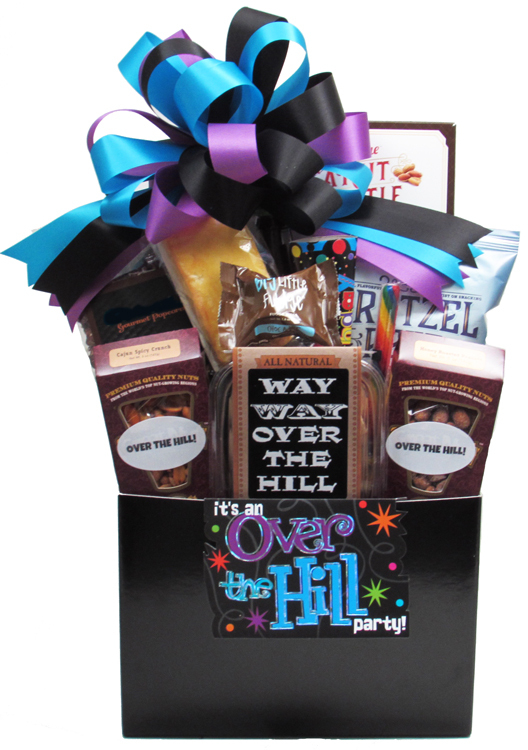 Home > Birthday Gift Baskets > OVER THE HILL PARTY! Lots of laughs and goodies for that special day! It's an Over the Hill Party! Your invitation is here! This black container is filled full with gourmet and not so gourmet treats! "Way Way Over The Hill" Shortbread Cookies (Butterscotch, Lemon, or Ginger), "Over the Hill" Box of Snack Mix, "Over the Hill" box of Honey Roasted Peanuts, Big Little creamy Fudge Bite (Milk chocolate or chocolate with peanut butter fudge), Wild Cherry Rainbow Stick (brings ya back in time when you were a kid! ), Black Birthday Horn, Individually wrapped Cake, Gourmet Popcorn (Almond Pecan Crunch, Cranberry Walnut Crunch, Dark Chocolate with Sea Salt, or Jalapeno Cheddar & Caramel), Pretzel Twists (Salted Carmel or Smoky Barbecue), Premium Craft Soda (Root Beer, Black Cherry, or Orange Dream), and a box of Peanut Brittle. Wrapped in crisp clear cellophane and topped off with a Handmade Bow. Includes a Handwritten Greeting Card - examples of the many things that you can say are; "Happy Birthday You Old Fart", "Hear You're Older Than Dirt, Happy Birthday", etc. Finished wrapped and decorated design is approximately 20"H x 15"W x 8 1/2"D. Container size: 10 1/4" x 6" x 7 1/2. Everything to celebrate the day!